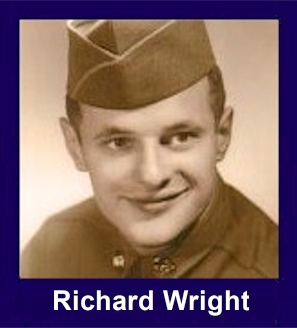 The 35th Infantry Regiment Association salutes our fallen brother, PFC Richard E. Wright, ER17259729, who died in the service of his country on March 29th, 1951 in vicinity of Changgo-ri and Chongsong-Sa, S. Korea. The cause of death was listed as KIA. At the time of his death Richard was 22 years of age. He was from Waseca County, Minnesota. Richard's Military Occupation Specialty was 4745-Light Weapons Infantryman. The decorations earned by PFC Richard E. Wright include: the Combat Infantryman Badge, the Purple Heart, the National Defense Service Medal, the Korean Service Medal, the United Nations Korea Service Medal, and the Republic of Korea War Service Medal. Richard was my older brother. I was eleven years old when he was killed in Korea, a day after his twenty second birthday. At the time, I thought he was quite mature. He was very good to his "kid" sister. As I grew up and had a family of my own, I realized how terribly young he was at the time of his death. I often think of him and feel cheated that I didn't have a chance to really know him on an adult level. He spoke of becoming a teacher after getting out of the service and I am sure he would have been a very good one. He loved nice clothes and brightly colored shirts. Every year, when I take flowers to decorate his grave, I try to pick brightly colored flowers, like the shirts he wore. Richard had a twin brother who found Richard's death so painful that he never talked about him. I pray that when old men make the decision to send brave young men and women off to war, they do it with the greatest prudence because many of those young people, like my brother, will make the ultimate sacrifice of a life cut short and unfulfilled. And, their families will suffer a lifetime of pain and loss. I called him Dickie. We love you, Dickie!